Prospo small edc sling bag is a developed one in the small bag market. Two side pockets,(one with zipper closure, the other with drawstring) is the most humanized design in case of the water bottle or something small to fall out. Effectively avoiding your embarrassment in public. 1.6 compartments,3 front pockets,1 main compartment,1 back compartment,2 side pocket. 4.One side pockets with elastic string to keep water bottle secured. One zippered pocket to get small tings organized. 5. "Y"buckles to ensure you won't lose balance. 7.molle system to let other pouch to attach .reversible clip to easy switch. loose heavy-duty handle as a hand bag. Pretty suitable as a edc pack to them park and a carry-on bag in a trip, roomy enough to carry all necessity like charge, cellphone, key, wallet, Ipad and water bottle. You will never go wrong with the choice. [DURABLE & WATER RESISTANT] Made of durable 600D polyster. Water resistant and scratch resistant.. [HUMANIZED DESIGN] 1.3 front pockets,1 main compartment,1 back compartment,2 side pocket. 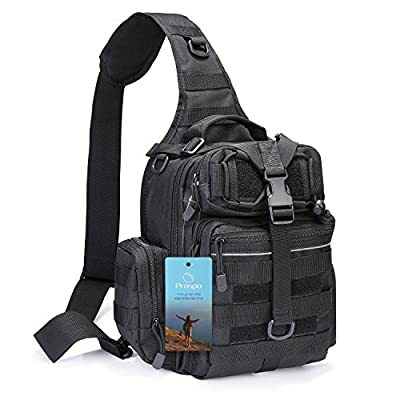 Keeps your necessity organized and separated.2.Side pockets with drawstring could ensure the water bottle secured in case to fall out to some extent.Functional and handy [COMPACT & SMALL] Sling pack size: 11*5.11*12.2 inches (L*W*H).Weight:1.5LB.Volume:11L. Enough for carrying 9.7 iPad Air, notebook, keys, wallet, cell phone, flashlight, gloves, chargers etc for a daily basis.Lightweight and roomy. [CONVENIENT & UTILITY ] 1.Equipped with adjustable waist belt and padded sling shoulder strap in case of any wave. 2.Two clips on the two sides make it switched between left or right hand side, suiting your body shape.3.MOLLE SYSTEM is armed with. You could attach any pouch to expand your room. Note: The extended strap can be up to 40''.And the waist belt is up to 35''.Very flexible and Casual [MULTIFUNCTIONAL] The heavy duty handle is made to hold comfortably. You can totally use it as EDC sling pack, chest bag, hand bag, tactical, versipack, pouch, first-aid kit, diaper bag and so on.